Is it possible to identify Baltic	and Heuglin's Gulls? By Chris Gibbins, IN: Birding Scotland 7(4), December 2004. Field discussions with delegates at the International Gull Meeting held in Finland in August 2002 considered the possibility that heuglini might show a tendency to have the red gonys spot restricted to the lower mandible, in contrast to graellsii and intermedius in which the red frequently extends onto the upper mandible. Analysis of photographs of heuglini taken either on the breeding grounds or in the Middle-East (n = 31) indicated that 71% lack red on the upper mandible. Analysis of data supplied by Mars Muusse, together with assessment of published photographs (n = 310) indicated that 56% of graellsii/intermedius lack red on the upper mandible. 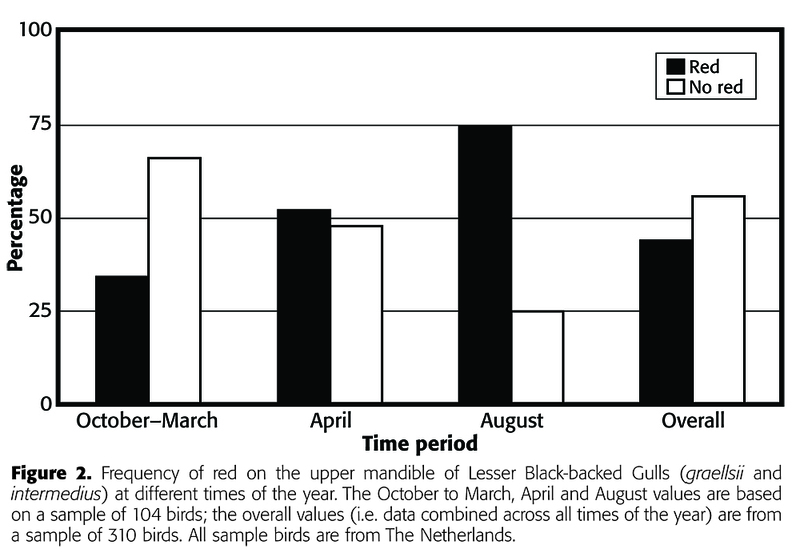 The data for graellsii/intermedius suggest that the presence of red on the upper mandible is season specific, being much more frequent in mid-summer when birds are feeding young than it is in winter (Figure 2). birds in their 15th calendar year can have both red and black on the upper mandible. The timing of the primary moult of adult birds is frequently cited as one of the key differences between heuglini and graellsii/intermedius. The primary moult of graellsii and intermedius usually commences in May and continues until November/December. The moult of heuglini is later, commencing in June/July and often not being completed until January/February. Two birds from around 100 heuglini seen in UAE in the period 28 February–16 March 2004 still had P10 regrowing, illustrating how late the completion of primary moult can be in this bird. The primary moult of heuglini is usually suspended prior to southward migration in the autumn whereas in graellsii it is usually continuous. 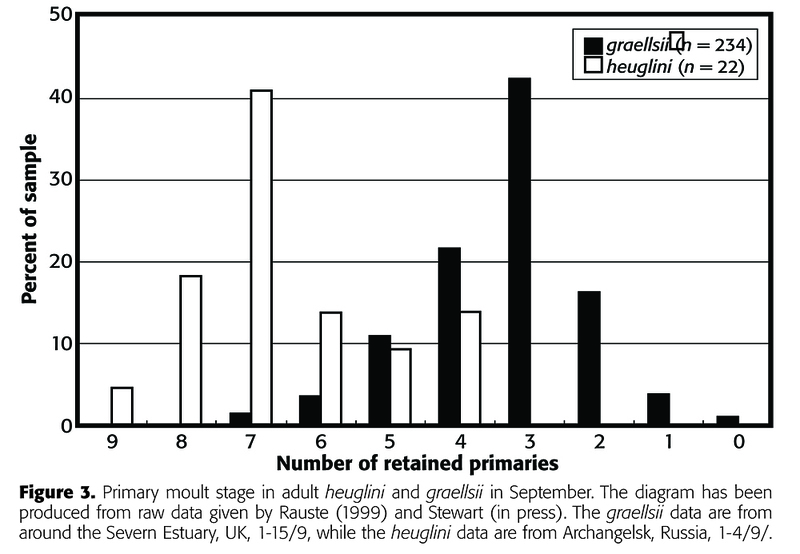 At the population level, the difference in moult between heuglini and graellsii is illustrated nicely in data given by Rauste (1999) and Stewart (in press). These data have been used to produce Figure 3. Plate 169 shows a heuglini photographed on 1 September; it is very typical, with seven retained old primaries and only one fully grown new one (P2 is not yet fully grown and P 3 is missing). On this date, the majority (77%) of graellsii have three or more fully grown new primaries (as per pages 166–167). initially mooted as a possible heuglini for this reason. The value of population-level differences in primary moult for the identification of individual birds is discussed with respect to the first case study bird (see part iv below). Like fuscus, a proportion of immature heuglini return to northern areas during the summer. cy and 3 cy heuglini are shown in on thi ssite as well. set of first generation primaries and start moulting them in May or June (Rauste, 1999). However, 5-10% of birds undergo some primary moult during their first winter (HERE, HERE, HERE, HERE). In June 2002 Visa Rauste observed two 2 cy birds in Komi, Russia, each with a full set of second generation primaries (Rauste, pers. comm.). In other respects they were typical heuglini. These two birds suggest that heuglini can undergo a complete primary moult during their first winter and so, in this respect, overlap with fuscus. Overall, heuglini appear white-headed and white-bodied in the summer of their second calendar year, with dark streaking usually restricted to the hind neck and, to a lesser extent, the head. The bill usually has a pinkish base and dark tip. Sometimes the dark tip is rather diffuse, sometimes it is rather sharp and Glaucous Gull-like. Some individuals can have yellow pigment beginning to develop in their bill and even some red around the gonys. As with fuscus, the underwing is usually rather white compared to graellsii and intermedius. Nonetheless, some second generation underwing coverts can show quite strong marks or barring; set against the white feathers, this can produce a rather contrasting underwing (HERE). sometimes look more reminiscent of 4 cy graellsii. This greyer wing is shared by many 3 cy intermedius (Mars Muusse, pers. comm., from observations of ringed birds). the feathers but some have a wholly white tail. Heuglini adult, May 01 2006, Tampere, Finland. Picture: Hannu Koskinen.